Many of us have seen that clichéd advertisement, where the tearful Indian mother offers a jar of mango pickle to her "abroad going son"—and a voice over extols the "mom ke jaise swad wala achar", with a tag line of the pickle brand. That yearning is a thing of the past if you are migrating to Canada—I have seen more pickle brands here, than I have in good old Mumbai. The reality of global trade and competition makes it possible for non-resident Indians (NRIs) to get a far more extensive array of the choicest Indian products in Toronto or Vancouver to be consumed by lakhs of Indians out here. 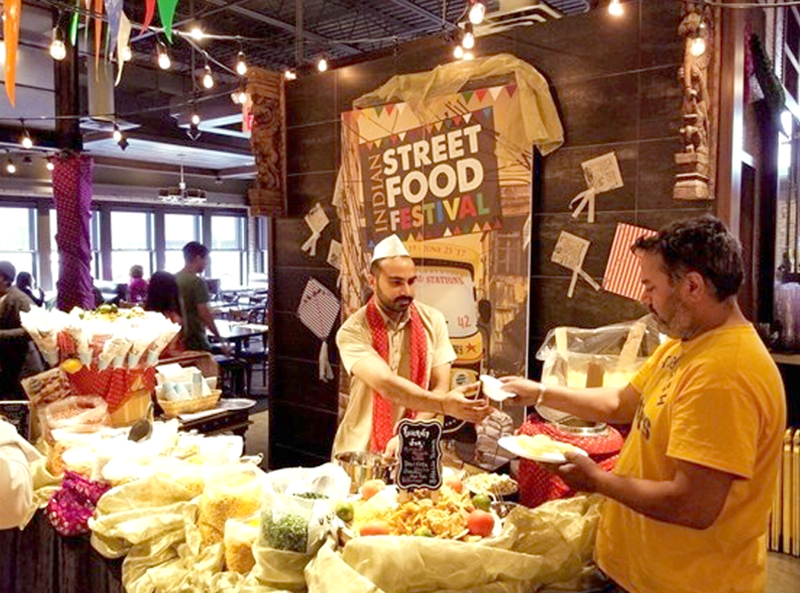 Toronto, is the largest North American market for ethnic Indian foods and arguably, even more diverse in variety of food on offer. This is also because Indians living in Canada have started producing products for the North American market. 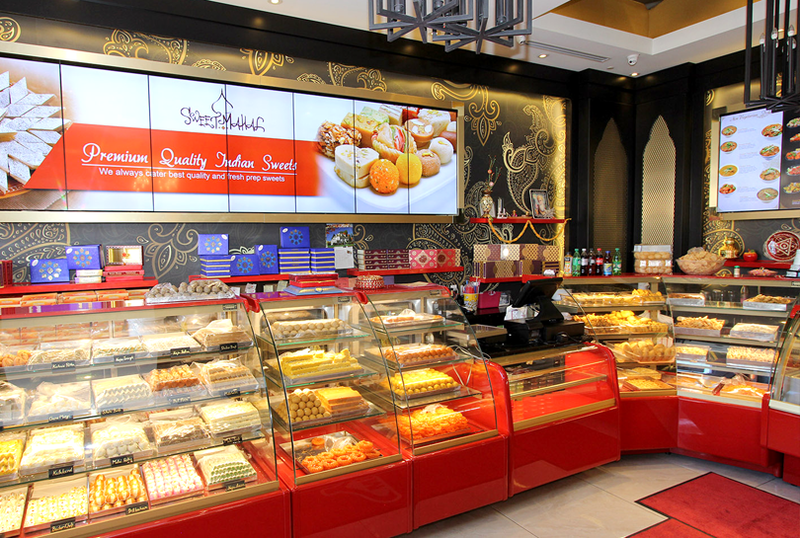 They range from atta (flour) to savoury packaged snacks, fresh or frozen, and even halal meats, which compete with thousands products imported from India. Toronto is also the largest market for halal foods in North America; these are not limited to meat but also include dairy products and much more. 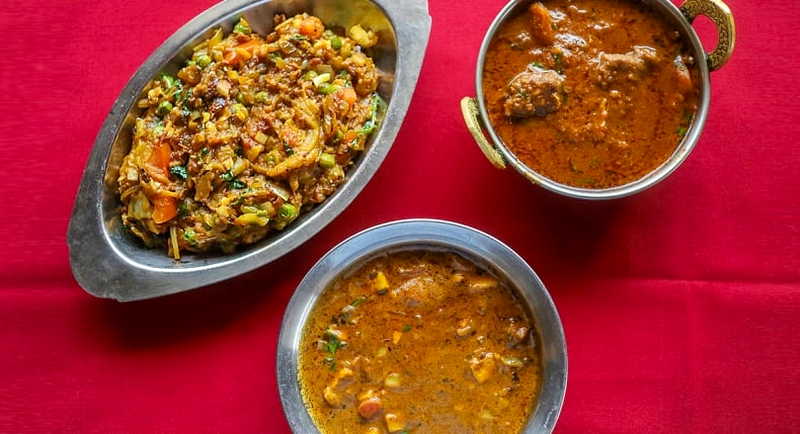 The best Indian food that’s also affordable is found in Toronto's suburbs such as Mississauga and Brampton. These twin cities are home to the largest Indian population in Toronto. While downtown Toronto does have Indian food, these are mainly upmarket restaurants that cater to "white population" or Canadians want to dine "Indian” and have limited repertoire. Indians looking for "gharka khana” (home food) can find diverse Indian fare, from north to south, under one roof at grocery stores in Mississauga or Brampton. These stores also stock food prepared by local housewives. Both cities also have hundreds of small eat-out only food joints too. The sheer range and variety of Indian foods and condiments available here is staggering. 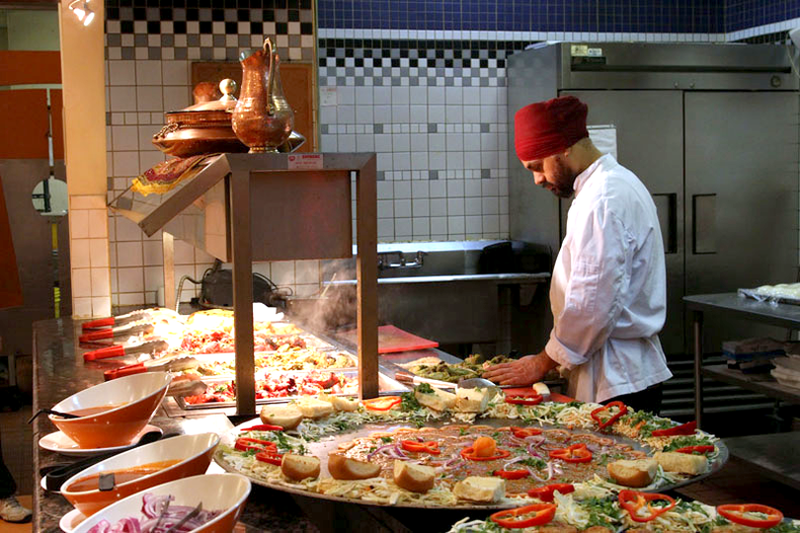 Not only do we have restaurants serving up buffets of south Indian food, but we have speciality restaurants offering pure Chettinand food, or Sri Lankan food for the large population from that country. At Scarborough, you will find south Indian stores stocking special fruits, yams and bananas integral to south Indian cooking along with traditional flowers plantain leaves. Even "smaller communities" such as the Goans, Parsis and Jains have their own special places! We Parsis get the famous Bombay Camay wafers' and thin potatoe sallis (or straws) used in traditional dishes at a store in Brampton. Is also stocks the famous Kohla pickles, including roe pickle and lagan nu achar (a must at Parsi weddings). The Goans have their prawn balchao and vindaloo masalas—some even selling homemade Goan sausages made by locals. The Jains have access to stores selling eggless cakes and stuffed chapattis that don't contain garlic, ginger or root vegetables. Unlike in India, where grocers stock a handful of well-advertised brands, people here aren’t brand conscious when it comes to traditional Indian food. Last week, a Tamilian friend offered me an authentic bitter gourd pickle that I thought it was made by her mom. Turns out, from a grocer just down the street, and made by small manufacturer who even stamped his brand in the local language. Perhaps the only Indian product that has been "branded" like never before in Canada is the good old samosa. Thanks to the huge Punjabi population, this inexpensive snack has even found its way to mainstream Canadian grocers and railway stations. Samosa brands are both Indian and Canadian and come in with a range of options – healthy, baked, frozen with a range of stuffings including chicken, beef samosas, paneer, palak and cheese. With more and more Canadians experimenting with Indian food, the largest Canadian grocery chain has launched a line of korma and butter chicken sauces. Interestingly, the India-Pakistan divide does not exist out here – every Indian and Pakistani grocer will stock brands from both countries and they are a go-to place for cooking foods with distinctly Moghlai flavours or getting the right mix for phirni sevaiyas and faloodas. Almost every year, there is a new Indian grocery chain stocking everything from condiments to masalas and even mithai under one roof. Nitin Divker, a Brampton resident and foodie attributes the food explosion to the entrepreneurship of Indian immigrants. Twenty years ago, Guru Laxmi, was started as a small time dosa joint from a food court in Mississauga by an Indian couple. They had Indians would queuing up to consume their dosas. Today, it is a thriving, independent enterprise, open seven days a week. Tandoori Flame, known for its buffet m is another such brand. Another food that Indians love is also thriving in Canada—Indian style ‘chinese’ hakka joints are finding a growing market among Indians, who do not find Chinese, served in the USA to their taste. When I have friends visiting from the US, I take them to "apna type chinese" eateries, with chefs from Kolkata of Mumbai. Another enterprising and low cost options for immigrants is the home food packages offered by many Indian women cooking from home. For just $6-7 (Canadian) you get dal, rice, chapatis and two vegetables— sometimes also delivered to your door. Mr Divker says Brampton also has restaurants offering packed ‘dabbas’ as early at 7 am that people can just drive in and pick up on their way to work or a morning shift. The dabbas have a range starting at as little as $7. For those who have subscribed to a daily, weekly or monthly package, the restaurant hands out your parcel without having to step out of your car – a real service in winter when temperatures hit minus degrees. And finally, for youngsters and students who don't want the traditional roti sabji, there’s fusion junk food such as butter chicken pizzas and tandoori chicken pizzas. For staunch muslim, their halal chicken burger or pizzas are now mainstream and offered by Walmart as well as McDonald’s as well. So if you are immigrating to Canada, the one thing you don't have to worry about missing is Indian food—it is a nice way of feeling less home sick and makes the assimilation and transition process that much easier! The US House Energy and Commerce Committee, which has jurisdiction over telecommunications companies like Twitter, is reviewing whether Twitter chief executive (CEO) Jack Dorsey provided false testimony before the committee in September, says a report from the Federalist. An aide for the committee told The Federalist that it is reviewing whether the Twitter CEO lied to Congress during a hearing about Twitter’s controversial history of arbitrarily censoring content published by the site. “The committee is aware of Twitter’s actions and is currently reviewing Mr. Dorsey’s testimony,” the aide told the Federalist after Twitter suddenly banned Jesse Kelly, a Marine combat veteran, writer, and popular radio talk show host, without explanation. The US House Energy and Commerce Committee should investigate all cases where Twitter arbitrarily closes all accounts without providing any reason. The line between editorial and sponsored content (i.e., advertising) just went from blurred to barely visible. NAD agreed with BuzzFeed that the addition of so-called affiliate links to articles with product recommendations written by BuzzFeed staff does not transform the content into advertising because (1) editorial chooses which products to feature without any input from the ad sales team and (2) the links are added only after the article is finished. In other (and fewer) words, content can retain its editorial status and attendant free speech protections even if it ends up generating advertising revenue. First, I’d like to address this portrait of editorial being completely walled off from advertising because that has not been my experience as a journalist operating in the digital age. Before coming to TINA.org I was the editor of a local news site that relied on advertising to keep the wheels turning. It was my first job out of college so naturally I possessed an idealized view of the church-state divide separating editorial and advertising. The ad guy assigned to my region quickly put an end to that. Not long after I started, he suggested that I write about a local florist he was in talks with in hopes that if I did, the florist might cave and take out an ad on the site. Similar requests would follow. While I scoffed at the idea of advertising affecting editorial decisions, I knew that the lifeblood of the site was advertising and without at least a few ads on the homepage, I’d be out of a job. I don’t see why the same thing wouldn’t apply to BuzzFeed and its writers. Second, in deciding whether something is an ad or not, why should the intent of the original editorial product (in this case, to educate readers and not sell merch) matter if the end product generates advertising revenue? IMO, that’s what makes it an ad. Affiliate marketing is marketing. While the NAD decision comes from the system of self-regulation in the advertising industry and should not be interpreted as law, I believe this sets a dangerous precedent for advertisers to manipulate editorial content for the purposes of avoiding scrutiny of advertising claims. It’s a loophole that should have never presented itself in the first place.